With a massive influx of immigrants from across Africa and the Middle East, and growing poverty, Italy voted in a populist government representing policies which would seem to virtually overturn the postwar European order. The austerity measures which have been imposed upon the Italian people have pushed more and more of them down into poverty, with the poverty rate doubling over the course of the past decade. Relative to migration, Italy is one of the Southern European countries taking the brunt of the migrants who are flooding into Europe by the thousands, helped along by various NGOs which seek to alter the demographic makeup and economic and political order of Europe under the guise of humanitarianism. The present economic metrics tend to perceive the profits of multinational corporations as a gauge of the health of the economy, rather than the economic situation on the ground level, faced by the Italian citizen. All of these and more are things which this new government has a view towards radically changing. To combat Austerity, which may be tossed out the window, the option on the table is to review treaties to which Italy is partied which impose or advise them. Rather than gutting the population for the money which the government needs in order to cover obligations to multinational financial interests, a proposal was broached of launching a universal basic income, reduction in the pension age, as well as a flat tax system. And while the migrant policy is still evolving, it has had a view towards repatriating the migrants which are already within Italy’s borders. Italy has already flexed its will on the migrants issue over refusing a ship full of migrants port in Italy, forcing it to set sail for Spain. Foreign policy aims at softening the approach towards Russia by eliminating sanctions and by putting the focus on improving relations, benefitting Italy both by allowing a resumption of trade, and the perspective of Russia’s will and capacity to help get a handle on the situation in the Middle East, which is part of what prompts the migration issue, due to the region’s instability. What this could mean is that an already strained relationship between Italy and the EU could be put to the test, or altered in a significant manner if these proposals are put into play after the fashion in which they were introduced during the elections cycle. Italy’s new government represents the most radical challenge yet to the order that has dominated Europe since World War II. Comprising the populist-left Five Star Movement and the populist-right League, the coalition is often described as a combination of alt-left and hard-right, but in fact it moves beyond conventional ideological categories. No wonder its members have been darkly described as “barbarians” by the Financial Times and “insurgents” by the Telegraph. Something in the project of European integration is not working, and the elites who lead it have refused to adjust. The euro is failing miserably in southern Europe, yet the European commission wants to deepen economic and monetary union. The euro has powered German economic growth while saddling countries like Italy and Greece with austerity and debt. According to official government statistics by Istat, absolute poverty in Italy has doubled in the past decade, a few years after the euro was introduced as the country’s currency. Even more radically, the 31-year-old leader of the Five Star Movement, Luigi Di Maio, has challenged the tyranny of economic metrics. In a speech prior to the election, he said: “The economic indicator for growth will no longer be GDP.” This represents a fundamental challenge to the free-trade post-war order, which has culminated in the rule of multi-national corporations over small businesses and enterprises. To address Italy’s public debt crisis, the program rejects austerity measures and seeks to revisit EU treaties that recommend them. In place of austerity, the coalition has proposed a minimum salary, a universal basic income, and a lowering of the pension age. What has raised some eyebrows is the League’s proposal for a more libertarian flat-tax system. How can the government increase spending while also decreasing its revenue? The coalition claims that the program will be paid for by eliminating bureaucratic inefficiencies and by subsidies from the EU. And Italy does indeed have a problem with corruption—Five Star built its popularity by campaigning against it. This would be the toughest stance yet taken by an EU member in Western Europe. (It is interesting to note that Switzerland, which is not part of the EU, has maintained very strict immigration controls and received very little criticism for it.) The measures proposed by the coalition prompted the president of the European Commission, Jean-Claude Juncker, to say that the European Commission will now “monitor the rights of African migrants in Italy.” This comment suggests that a collision over migration is imminent, particularly given the EU’s stance toward countries that have taken a tough stance on migration, such as Poland and Hungary. 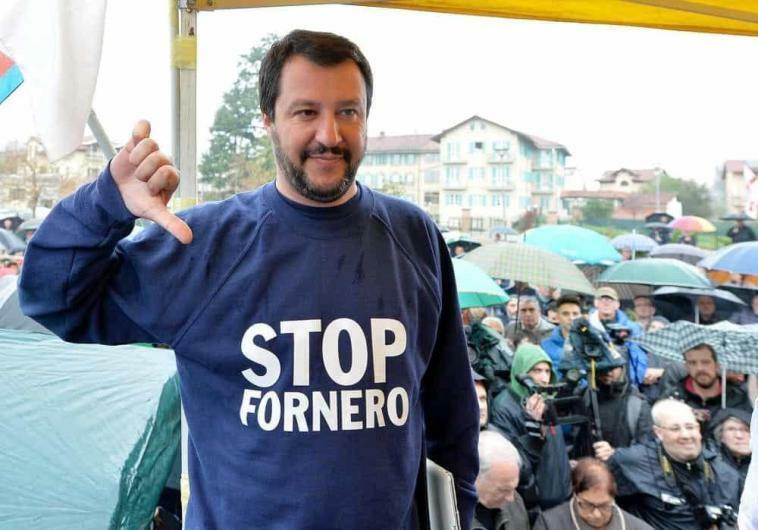 Salvini may be even more outspoken about his faith. In March, just before the election, he held up a rosary at one of his rallies, “swearing allegiance to the Gospel and my people.” The chosen prime minister, Giuseppe Conte, a previously unknown figure, is a former leftist who turned to the Five Star Movement. Conte is devoted to Padre Pio, a Catholic saint famous for his stigmata and bilocation. The Five Star–League program combines euroskepticism, environmentalism, strong borders, protection of families and small businesses against globalization, and respect for religion. It combines elements of left and right in a way that scandalizes well catechized political elites. If it succeeds, it will be the first real sign that we are moving beyond the postwar order. The EU is under a lot of strain. German Chancellor, Angela Merkel, might be looking at a weaker governing coalition if she isn’t able to get a solid grip on the migration problem in Germany. Britain’s Brexit continues to trek along, albeit at a sluggish pace, without much of a road map as to how it is going to be accomplished, and how the UK’s relationship with the EU will be positioned once the deadline finally comes. Italy here is considering renegotiating its relationship with the EU after a fashion, France is facing internal conflicts over migrants and the economic situation of average citizens, while Poland and Hungary are both defying the Union’s will on the migration matter. And last, but not least, the populace of Greece still isn’t too happy about the austerity measures it is undergoing, while international investors gobble up the nation’s infrastructure at an alarming rate, with a government that is just barely hanging onto power. Then there are the security and energy issues to be solved. Germany, and some others, are moving forward with a pipeline to import Russian gas, which some Eastern European nations are apathetic about, leading to some disagreement about where Europe’s energy security looks to. To top it all off, there are Trump’s tariffs and secondary sanctions threats relative to commerce conducted with Iran, a necessary component of the JCPOA’s survival, and the Nord Stream 2 pipeline, which puts Germany between the US and its Eastern neighbors over its energy policy. But Trump, not merely a wild card in the deck, could pose as Europe’s saving grace, serving as a unifying factor for the bloc. While Europeans are facing lots of centrifugal issues which threaten to break it apart, Trump is the one problem which they all have in common, and is one which would offer a rallying point around which the Europeans can gather together to combat, after a fashion. The situation in Europe, therefore, is one which necessitates a revision of its constituent relationships, a common plan to deal with migrants, both those already in Europe and with those yet to arrive, look out for the interests of the common person, a common policy towards the East, and a common political will to oppose unilateralism and extreme nationalism.